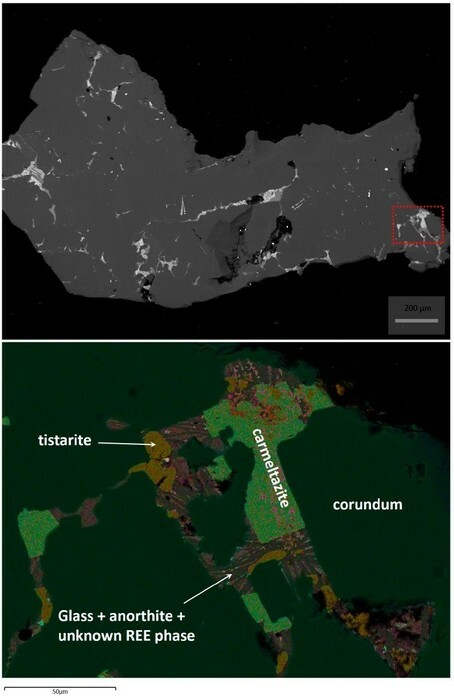 Tistarite: Mineral information, data and localities. Name is derived from the word "star", and the composition "Ti", implying that this new mineral is likely a condensate among the first solids formed in the solar system at the birth of our star. Hematite Group. One of just a few currently known phases with essential trivalent titanium, including grossmanite, 'UM1971-21-SiO:AlCaMgTi' and 'UM1978-08-O:AlCaCrFeMgTi'. Smithsonian Institution, National Museum of Natural History, Washington, DC, USA, catalog no. USNM 3510-6. Ma, C., Rossman, G.R. (2009) Tistarite, Ti2O3, a new refractory mineral from the Allende meteorite. American Mineralogist: 94: 841-844. Griffin, W.L., Gain, S.E.M., Adams, D.T., Huang, J-X., Saunders, M., Toledo, V., Pearson, N.J., O’Reilly, S.Y. (2016) First terrestrial occurrence of tistarite (Ti2O3): Ultra-low oxygen fugacity in the upper mantle beneath Mount Carmel, Israel. Geology: 44(10): 815-818.